(141.01) */JU 16 23 on KGV 2d (SG.134) affixed PSRE piece, boxed reg. h/stamp alongside. (147.02) C/MR 23 22 on KGV 1d, 2 x 2d (SG.113a,115) piece, boxed SUMBUYA reg. h/stamp. (156.02) C/JA 16 22 on KGV 1d, pair KGV 2d piece, handstruck WATERLOO reg. handstamp. (156.02) C/MY 15 22 on KGV 1d, pair KGV 2d piece, handstruck WATERLOO reg. handstamp. (156.02) C/SP 11 22 on KGV 1d x 2, KG6 3d (SG.116ba) piece, handstruck WATERLOO reg. handstamp. (156.02) C/OC 9 23 on KGV 5d piece, cut out and pasted handstruck WATERLOO reg. handstamp alongside. (156.02) C/SP 9 24 on KGV 1d x 2 (SG.132) on PSRE piece, handstruck WATERLOO reg. handstamp. (099.01) */MY 21 25 on KGV ½d, 1d (SG.131,132) piece, handstruck MAKENE reg. h/stamp. 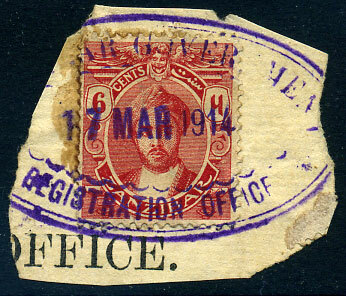 (118.02) C/NO 8 28 on KGV ½d, 1d (SG.131,132a) piece, part handstruck (MURRAY) TOWN reg. h/stamp. (105.03) */JA 3 2(5?) 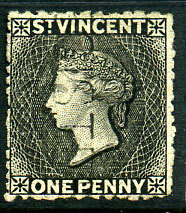 on 2 x KGV 1d (SG.132) added PSRE piece, blue reg. label, toning. 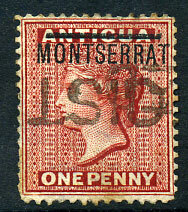 20 JAN 1926 on SA 1d x 2, 4d piece, boxed reg. h/stamp. 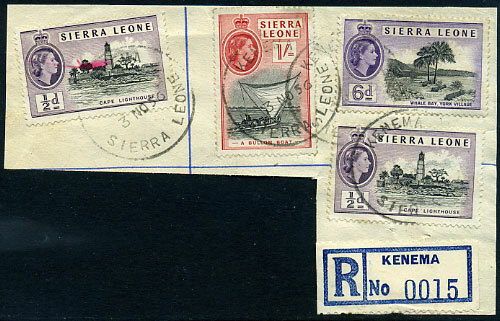 (072.05) dated 3 NO 56 on QE2 ½d x 2, 6d, 1/- (SG.210,216,217) piece with "KENEMA" blue reg. label. (124.01) A/12 JY 23 on KGV 3d (SG.136) on piece with hand-struck PENDEMBU reg. h/stamp. (117.02) C/JA 9 24 on KGV 1d, 2 x 2d (SG.113b,115) piece with boxed MOYAMBA reg. h/stamp (R2). (005.02) A/JY 11 25 on KGV ½d, 2 x 2d (SG.132a,134) env. piece, m/script "No 62 Bananas" registration. (016.02) C/NO 10 25 on KGV 6d piece, boxed registration h/stamp. 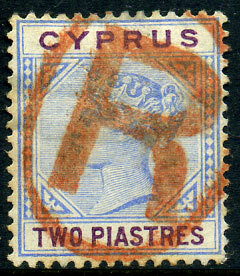 (015.02) PSRE piece with added KGV 2d dated C/JY 8 24, boxed registration h/stamp. (129.01) */AP 16 21 on 2 x KGV 2d piece with boxed reg. h/stamp. (129.01) */OC 8 21 on KGV 1d x 2, KGV 2d piece with boxed registration h/stamp.